LIVERMORE, Calif., March 22, 2012 — The 192 lasers fired in unison at the National Ignition Facility (NIF) this week delivered a record 1.875 million joules of ultraviolet laser light to its target chamber, exceeding NIF's original design specification and setting the stage for full-power experiments in the coming months, officials said. The record-breaking laser shot, made March 15, involved a shaped pulse of energy 23-billionths of a second long generating 411 trillion watts of peak power, 1000 times more than the entire US uses at any given moment. 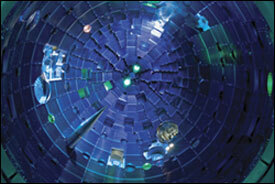 It surpassed a critical milestone toward achieving fusion ignition and capturing the power of the sun in a laboratory. 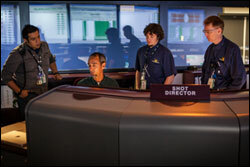 In addition to having the highest recorded energy threshold, the shot was also one of the most precise ever fired at NIF: The energy produced was within 1.3 percent of its goal. Such precision is vital because the energy distribution among the beams determines how symmetrical an implosion is obtained in capsules containing fusion fuel. Implosion symmetry is a critical factor in achieving the pressures and temperatures required for ignition. The achievement comes as NIF celebrates its third anniversary: Operations began in March 2009, when 1-MJ operation was first achieved. Since then, the facility has increased its operational energy about 1 kJ every day. "This event marks a key milestone in the National Ignition Campaign's drive toward fusion ignition," said NIF Director Edward Moses. "While there have been many demonstrations of similar equivalent energy performance on individual beams or quads during the completion of the NIF project, this is the first time the full complement of 192 beams has operated at this sound barrier." The ultraviolet energy produced by NIF (after conversion from the original infrared to ultraviolet light) was 2.03 MJ before passing through diagnostic instruments and other optics on the way to the target chamber. Located at Lawrence Livermore National Laboratory, NIF is now the first 2-MJ ultraviolet laser, generating nearly 100 times more energy than any other laser in operation, and operating around the clock. 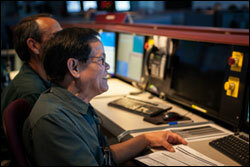 Moses said that NIF will pursue operations at even higher power and higher energy levels to achieve ignition.